Old Rishworthians slipped to the foot of Yorkshire One with a 28-8 defeat away to Keighley in a basement battle. The Utley side started the day at the foot of the table with only one win but their four tries to one victory saw positions reversed. The Copley club’s team appeared stronger with the returns of Anthony Shoesmith and Wesley Aldridge. Wingers Luke Flanagan and Shoesmith gained valuable ground and looked dangerous in the early exchanges. An injury to the Keighley outside half Rob Wilkinson held up play for five minutes but when play resumed, a penalty in the visitors half enabled Josh Kelly to find touch on the opposing 22. The line out was lost but Flanagan and Shoesmith combined well to take play back into the home 22. From a chip through by Kelly, Doug Heseltine scored a try in the corner which was not converted. This deserved lead was soon wiped out. From the kick off the ball was kicked deep and Leigh Sugden, the home No 8, barged over following a line out. The try was converted by Ryan Gibson. An injury to Ben Hinsley after 20 minutes resulted in him taking no further part in the game and Chris Flanagan moved to centre. The home backs started to look dangerous and following a missed tackle Jake Duxbury, the Keighley fullback, scored under the posts. Gibson converted. Rishworthians were gaining good quality line out ball from Fraser Swarbrooke and Gerard Rollings but the backs were unable to gain ground. From pressure by Calum Heseltine and Chris Stone, Keighley conceded a penalty and Kelly kicked the goal. However, Shoesmith was yellow carded and Keighley made the extra numbers count with an Alfie Seeley try converted by Gibson to make it 21-8 at half time. Rishworthians commanded territory and possession in the second half but they were unable to create any breaks. The strong tackling of centres Alan Ebbrell and Adam Horsfall ensured that the Copley men were running laterally. Tom Jowle created space and was brought down short of the line and then Luke Flanagan, who had been dangerous all game, was tripped on the Keighley 22 but the referee did not give a penalty. Sam Bake started running from full back and only a desperate tackle by a Keighley player stopped him. Greg Day was industrious and Aldridge provided some clever off loads to supporting players but there were no line breaks. 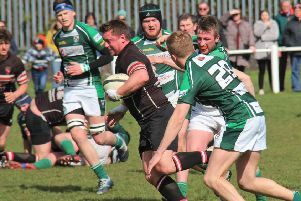 Keighley rounded off the scoring with their fourth try after a rare visit to the Old Rishworthians half. It was converted. Rishworthians’ development team beat Keighley seconds 55-26 and climbed to second in the North Championship Merit League. Tries were scored by Luke Sutcliffe 3, Kurt Sutcliffe 2, Lee Atkinson, Liam Phillips, Kian Sutcliffe and Cameron Emer. Joe Billing kicked five conversions.